Give Back is the crowdSPRING community’s way of helping worthy non-profit and charity causes in need. Creatives in the crowdSPRING community have agreed that for these special projects, no monetary awards will be given. crowdSPRING will waive all fees and will assist the organizations with posting their project. We will collaborate together to help those less fortunate. You can read more about the origins of Give Back here. We’re thrilled that the crowdSPRING community’s next Give Back project is for Reverb’s Campus Consciousness Tour. 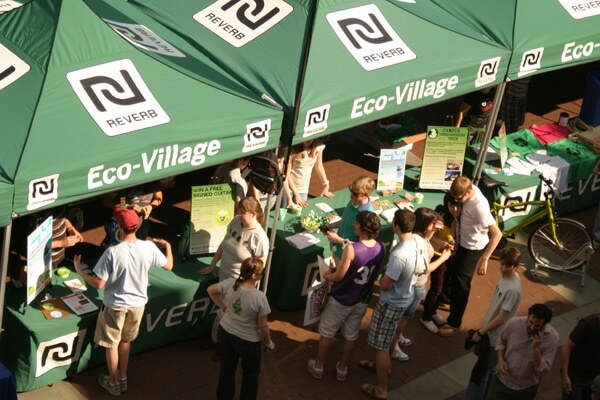 Reverb (www.Reverb.org) is an environmental nonprofit in the music industry that helps musicians green tours and make it easy for music fans everywhere to take environmental action. The organization is based in Portland, Maine. Reverb was founded in 2004 by environmentalist Lauren Sullivan and her musician husband, Adam Gardner of the band Guster. Half music tour, half environmental campaign, the Campus Consciousness Tour aims to inspire and activate students in an electric atmosphere while leaving a positive impact on each community the tour visits. The Tour includes many greening elements and is run to have a minimal environmental footprint. Reverb launched the Campus Consciousness Tour in 2006 as a way to redirect some of the light shining on popular musicians onto students and student groups. Past headliners include rising hip-hop star Drake, O.A.R., Guster, and the Grammy-winning artist Ben Harper. The Fall 2010 Campus Consciousness Tour will be headlined by Passion Pit and will be stopping at 10-15 college campuses from October 14 – November 14. To learn more about Reverb, watch the following two videos. A bit more in this video from Drake, talking about this past Spring’s Campus Consciousness Tour. Our entire community is honored to be helping Reverb. You can view the Logo for Campus Consciousness Tour project here. Please consider helping this worthy cause. You can help directly by participating in the logo design project, or you can help by telling others about this project and/or about Reverb and the Campus Consciousness Tour. As in all our projects, participation in Give Back projects is voluntary. Give Back projects work like standard projects, including contracts, wrap-up, notifications, etc. To help the learning process along in these projects, we encourage creatives to collaborate and to provide constructive feedback to each other. We’re fortunate to have an amazing community of creatives – nearly 65,000 of them, from 170+ countries. They speak hundreds of languages, cover all age groups, demographics, experience and religions. They’ve created logo designs, web designs, and custom graphic designs for companies in virtually every country of the world and in most languages spoken on the planet. We encourage everyone to find ways to help worthy causes and others who are less fortunate. Thank you – from our entire community!